Growing up in rural BC, in the mountains and lakes of the West Kootenays, my favourite season was Fall and my favourite holiday meal was Thanksgiving (a hint that next-up was Christmas). I even chose to get married at Thanksgiving! I promise this blog post has nothing to do with this co-chairmoose’s nostalgia for Thanksgiving! Thanksgiving in Northern California might feel a little different for many of us who have had the experience in Canada, but let’s all agree that whatever our individual traditions, it’s a great time of year to gather, feast and share thanks. 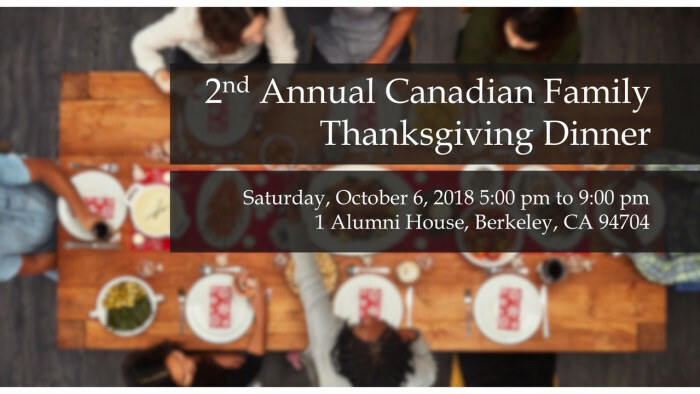 The Canadian Studies Program at UC Berkeley and the DML are thrilled to bring you another Canadian Family Thanksgiving dinner event this October 6, 5-9 pm PT. Similar to last year, we are offering a delicious smoked turkey buffet dinner and host bar included with your ticket. There will be plenty of time and activities for meeting fellow Canadian individuals and families throughout the evening. Each ticket will be automatically entered into a door prize drawing for two round trip tickets to anywhere in North America with Air Canada ($3000 value) and two VIP tickets to an upcoming DML hosted hockey game ($300 value, Canucks vs. Sharks or Maple Leafs vs. Sharks). This year, as part of DML Canadians Doing Good in the local community, we are proud to partner with Alameda County Community Food Bank as a beneficiary of our event. Five-percent of each ticket sale will be donated to their organization. You are also encouraged to bring non-perishable food to the event where it will be collected and donated. Working together, every small effort will make an impact for those most in need. Early bird prices end Saturday, September 29 11:59pm. Get your tickets here on Eventbrite. McGill alumni and University of Alberta alumni will receive 10% off their ticket with a special code. Please contact your local alumni representative or email us <programs@digitalmooselounge.com> for the code. Special thanks to our partners for supporting this event: BC Trade and Invest, One Capital Management, Royal Canadian Legion, McGill University, and University of Alberta. Look forward to celebrating this Canadian holiday with you! Thanks for waxing nostalgic with us!